I have been interested in diesel motorcycles for ages, the first one being a Matchless fitted with a Fuji/Robin engine built by Ernie Dorsett. This was pictured in a 1986 December edition of Classic Bike magazine. As time went by all the diesel conversions seem to be either old British bikes or Cossacks. It wasn’t until I saw the Suzuki Changfa conversion that I was inspired to have a go. I started looking for parts as a pricing exercise to start with. First of all I looked for an engine and found a shop on Ebay that sells them for £300ish including delivery. Next was the rolling chassis but what to go for? So a look through a few issues of UBG gave me a few options. With these in mind a look on Ebay told me how much they were going for. Then it was on to the transmission. A popular choice seems to be the Comet torque converter although Royal Enfield gearboxes are still available. Or even an old British one? With the pricing sorted I had an idea of what the monetary outlay would be so I set about finding a rolling chassis. 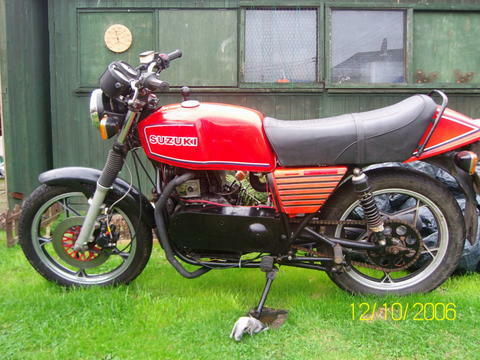 When I saw the Suzuki Changfa build pictures and a shot of a GSX 250 I realised that the bottom ends seem to be of comparable size so I set about looking for either a GSX 250 or 400 which were numerous on Ebay at the time. I found one near to my brother-in-laws which I bid on and watched. Kevin phoned the next day and it turned out he had bought a quad cheaply, not just any quad but a Polaris D-BAT 4X4 DIESEL, which he liked but felt was too slow. I mentioned to him my project and a plan was formed for me to buy the bike and for him to have the engine, unfortunately I was outbid . A week later Kevin phoned and said a mate of his had a GSX 250 which was stood in the garden & was willing to sell . That weekend I drove down to Kevin’s to see/buy the bike, which turned out to be not only complete but also a runner with a log book. All that for £100. Back at Kevins’ we strip the engine, ignition system and exhaust from the bike and I loaded the diesel engine ( a Yanmar L100 406cc complete with mounting plate and exhaust ) into the boot of the car and drove home. So there I was with two out of the three major parts of the build for just £100! Off to the shed I went to have a look at the engine. The first thing I had to do remove was the remains of the quad belt drive. This was a substantial aluminium housing held on by a bolt through the crankshaft. After much persuasion off it flew to reveal a taper shaft. Not what I wanted but as the saying goes ’beggars can’t be choosers‘. With the crank shaft being a taper it was easier to rule out a Comet Torque Converter so I had to look for a clutch and gearbox. Yet again I looked on Ebay and found a three speed gearbox complete and with clutch for a total of £36. I now had all three of the major components I needed and was ready for the build. I started with the gearbox but the sprockets were of different dimensions. A pattern gearbox sprocket was not available so I had Talon Sprockets retooth the original to match the GSX rear. With the sprocket back on the gearbox I offered up the gearbox to the frame and found I only had to move one of the lower mounts. With an extra bracket fabricated for the front of the gearbox and a few spacers everything lined up fine. Onto the engine but before I could fit it I needed a flange to hold the sprocket onto the crankshaft. I got the vernier calipers out and measured the very end of the crankshaft then I measured the start of the taper. These two measurements give an angle when joined up on a drawing but what was needed now was the distance between these these two points. 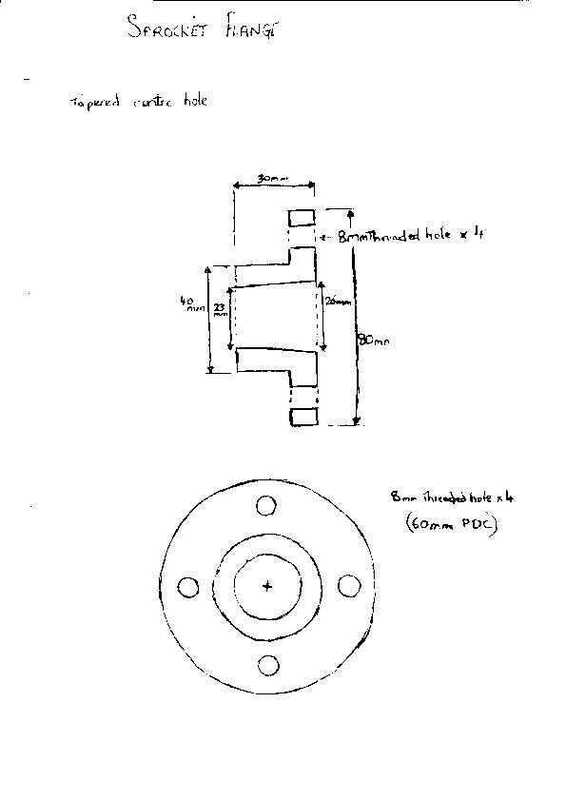 With the previous measurements done they gave the internal shape of the flange, the rest of the flange being designed to include a ring of 4 bolts which bolt the sprocket to the said flange. I didn’t have access to a lathe so I had to make sure my drawing had all the measurements required to machine it. With the drawing in hand I approached a local machineshop who were willing to make it and they charged me the reasonable sum of £10. I tried the flange on the engine and it fitted first time which was a relief. I now needed a sprocket to match the pitch of the one on the clutch so I took a trip to Talon Sprockets. They were very helpful although unable to help as it turned out, the dimensions being 3/8 x 7/32 (o6b1) and no longer used on motorcycles. But they were used in industrial applications and readily available. Drawing link. With the sprocket mounted on the flange and that fitted to the engine the engine could be fitted in the frame. The frame itself would need modification and although I can weld I enlisted the help of my mate Andy. First stage was to cut the down tube and lower rails so the engine would fit in. With this done and the engine on its mounting plate, it was jacked up into place and lined up with the clutch sprocket . Two tubes were fabricated to join the original lower rails. These were to run under the engine and up to the shortened down tube. With the alignment checked, Andy welded it all up. Now that the engine was in place I only had a few things to do, or so I thought. I made an exhaust out of the original, sorted the wiring and routed the control cables. Some of these had to be altered. A hand gear linkage needed making as having the rear brake and gear change on the same side was not a sensible option. Then a final piece to the drive train a primary chain case. This was made using old washing machine panels. Once the bike was altogether I just had to start her up and give her a test ride. Kev had told me the engine needed a lot of turning over to run so I just thought this was down to technique. When I tried to start it and it refused I went through everything. I bled it, I checked the valves were sealing properly because compression could have been down. I had the injector checked and checked the timing, but it still didn’t run. There was nothing else for it but to remove the piston. Out came the engine and with it on the bench I found you need to remove a side plate to access the sump/bottom end to remove the piston. On pulling the piston out I found that it was broken. This break was between the two compression rings and, after measuring the rings I found out somebody had fitted (L90) 84mm bore rings instead of the correct (L100) 86mm bore rings. Thus when the rings rotate around the piston, which they are free to do, at some point the open ends will inevitably line up. This is what must of happened and the excess gap caused that part of the piston to fracture. Once a new piston and rings were installed the engine was rebuilt and installed in the bike. With everything back together I was ready to test fire the engine. With trepidation I pressed the starter and it fired up and settled down to a steady tick over. What a relief! 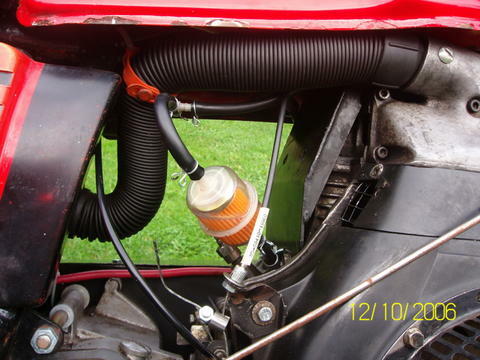 Many thanks to Richard for being the first to submit a report of how he built his diesel motorbike!